I am not sure exactly where I learned about focus-stacking; I probably read an article or mention of it somewhere. It sounded to me like a possible refuge from shuttling back and forth between the narrow depth-of-field of wide apertures and having my photos eaten up by the diffraction of high apertures. I simply wanted more of my subject in focus than I could achieve by traditional methods. At the same time I didn’t like the idea of what I thought was “artificialness” of focus-stacking. It was like those snow machines on the ski slopes around here, producing synthetic snow instead of the real stuff. I had a lot to learn. 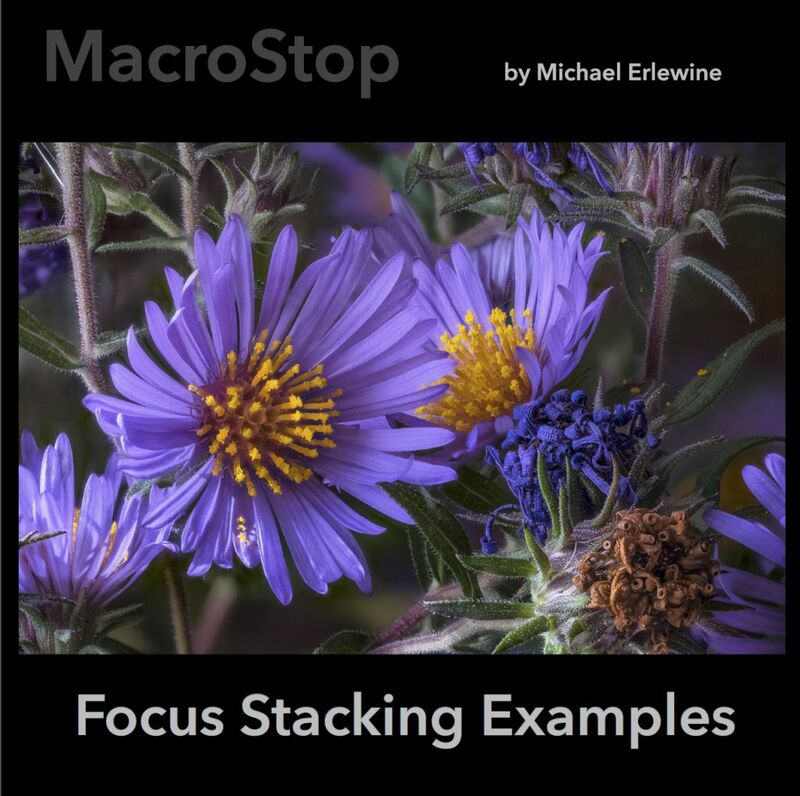 Many folks approach focus stacking as a way to gain more apparent depth-of-field, you know, more of the whole photo in focus. Certainly, that was how I started out. Yet, as it turned out, what I didn’t know back then is that what I really wanted was less of the photo in focus or just the parts I wanted in focus. So that was a slow turnaround for me, that transition from wanting everything in focus to wanting less in focus. In my case, as a nature photographer, my initial impulse or intent, which perhaps I did not realize at the time, was more along the lines of creating photos of plants and animals like you would see in a field guide (nature photos), but with more of the subject in focus. It was very much me with a camera recording what I saw out there in nature accurately, realistically, and, as mentioned, with as much of the subject of the photo in focus as possible. This kind of went without saying. I never even thought about it. And I believe this subject/object approach is very normal, where most photographers start out, me the photographer taking pictures of what is out there in the objective world, almost a form of documenting my own existence. Certainly my eventual change of view was something that was acted out in extreme slow-motion. I never saw it coming; it was almost like a ballet acted out in the background, beneath the threshold of my consciousness. Somewhere along the line I stopped photographing what was out there in the world, so to speak, and began photographing what was in here, in my mind. I stopped trying to be objective and began to realize that I was actually photographing my own subjectivity. What started coming through in my photos was not actually objective, but rather my own impressions of life – impressionistic. I have come to believe that all experienced photographers go through something like this change, from looking outward objectively to looking outward subjectively, that is: starting to see own inner self reflected in our photos. In other words, after a while we are always only photographing our own mind and view. And this is not a minor point, IMO. Certainly, as I look at my earlier photos, they are photos of nature, and not very good photos at that. They have no ambience, atmosphere, and very little interest, at least to me. It was me being objective, or trying to, as if there is such a thing as objectivity anywhere. I am persuaded of the thought that, try as we might, we only can take pictures of ourselves, nothing more. The sooner we realize this, the better, at least for those who have to view our photos. Score one for Narcissus and selfies. We can’t help but see ourselves wherever we look. The whole world is our mirror, especially if we have a camera. When I look back at my early nature photos, all I can see is an attempt to actually take a picture of whatever the subject is. There is no real composition other than to center the critter or plant in the frame. I call it “Gotcha!” photography. I was on the hunt for something “natural” to photograph. These days I am a photographer of the “found.” It no longer is what I photograph, but how I photograph that is important, very much the process that determines the result.